SEPA stands for “Single Euro Payment Area” and thus the desire for a Single Euro Payments Area. To achieve this goal, the European Payments Council (EPC – European Payment Council) has been working for many years. The first pioneering step was the introduction of the SEPA Credit Transfer 2008. SEPA allows bank customers on a single form national and cross-border European payments (including Iceland, Switzerland, Norway and Liechtenstein) to make and comply with the EU Directive on payment services in the internal market. One advantage is that the bank processing time of a transfer must also be an EU-wide maximum of three working days. In short, the SEPA Credit Transfer dissolves gradually EU standard transfers and in the long run from the classic domestic transfer. What changes through the SEPA Credit Transfer? Most bank customers have only heard about SEPA in passing. Primarily, the new European account numbers and sort codes are available as International Bank Account Number (IBAN) and Bank Identifier Code (BIC) on the account statement or at least appear in the online systems. In future, they will be replaced by different national bank organized data. For consumers, this means that in the future instead of the IBAN account number and the bank code you need to instead remember the BIC. IBAN and BIC were introduced by the European Committee for Banking Standards (ECBC – European standardization body). BIC: the Bank Identifier Code is a comprehensive eight to eleven digits number-letter combination. The first four digits represent the bank code (BBBB), followed by the two-letter country code (CC), a two-digit coding of location (LL) and three points for the branch or department (bbb). This results in the following pattern: BBBCCLLbbb. To cite just one example: The BIC of Postbank is PBNKDEFF. For a SEPA transfer, you need the name of the Beneficiary, IBAN and the BIC of the Beneficiary. They must be entered into the form (or online) accurately. In addition, the amount to be paid, the purpose and the name, place and the IBAN of the client. In principle, change SEPA only the data for the database connection. This payment will be made much faster. However, the transferred may be only made in Euro and to the countries that allow SEPA transfer. Please a need help ! 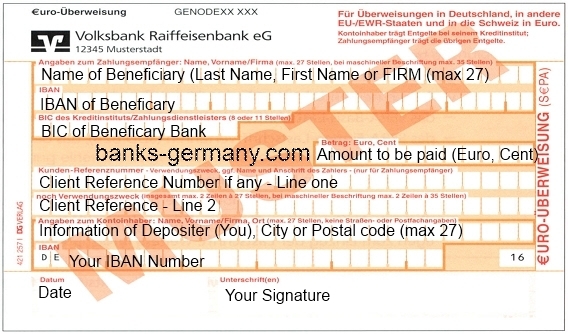 He is asking for your bank account information (IBAN and BIC) so that he can set up a SEPA direct debit (https://banks-germany.com/transfer-money/direct-debit) for your room rent. However, you won’t have that since Fintiba does not provide a current account (Girokonto), but only blocked account service (https://banks-germany.com/blocked-account-germany). You will have to open a normal bank account (Girokonto) when you arrive in Germany to make regular payments to your hostel. So you will have to tell him that you don’t have a bank account yet, and have to open one when you arrive in Germany. Normally, the manager at the Studentenwerk (Student Union) who takes care of the hostels would understand that foreign students won’t have a bank account. So don’t worry.